Sam leads Profit with Purpose measurement at LeapFrog, and the firm’s thought leadership on integrated performance. She oversees FIIRM, LeapFrog’s proprietary Profit with Purpose measurement framework built for financial services and health, emerging consumer insight, and convenes LeapFrog’s global portfolio performance review, driving both integrated Profit and Purpose performance. Sam has 10 years of Profit with Purpose experience in emerging and developed markets. 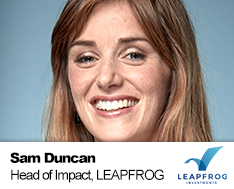 Sam joined LeapFrog as an early member of the Southeast Asia deal team, building on her strong transaction background from Goldman Sachs (Investment Banking M&A, Healthcare), as well as roles at EMP (Central American Mezzanine Infrastructure Fund, now under LAP), the Grassroots Business Fund (India) and TechnoServe (Honduras). Sam has also held operating roles, first as a Performance Improvement Consultant at PricewaterhouseCoopers, and subsequently as Head of Economic Development (Microcredit) at SKIP (Peru), where she ran a microfinance program for 100 small scale borrowers, and built new initiatives to open up business opportunities, housing and healthcare to SKIP’s microcredit borrowers. Sam holds a BCom from the University of Queensland (Valedictorian) and an MA in International Relations from Johns Hopkins SAIS (Valedictorian), and speaks Spanish.